Today’s the day! It’s exactly a year ago today the EVE: Valkyrie’s Carrier Assault Mode was launched, and true to our word, we’re going to celebrate it in some considerable style. First up, as we promised last week, today is going to be all about Carrier Assault with the play mode being available all day in multiplayer mode. It all kicked off this morning and it’ll run up until 08:00 UTC tomorrow (21st Jun). Primarily, we want you to just get out there and have a blast, taking down as many carriers as possible and generally honing your skills. That said, we would also like you to share your leviathan-downing antics through the magic of videos and screens. We want it to be a visual celebration of the skill, heroism and general epic madness we encounter during a Carrier Assault battle. Use today and the rest of the week as an opportunity to capture your best moments (or if you’ve previously posted some Carrier Assault footage, we want to see that too) and share the results via #ValkyrieCADay. We’ll come back in a week or two with a magnificent visual montage of all your finest moments. 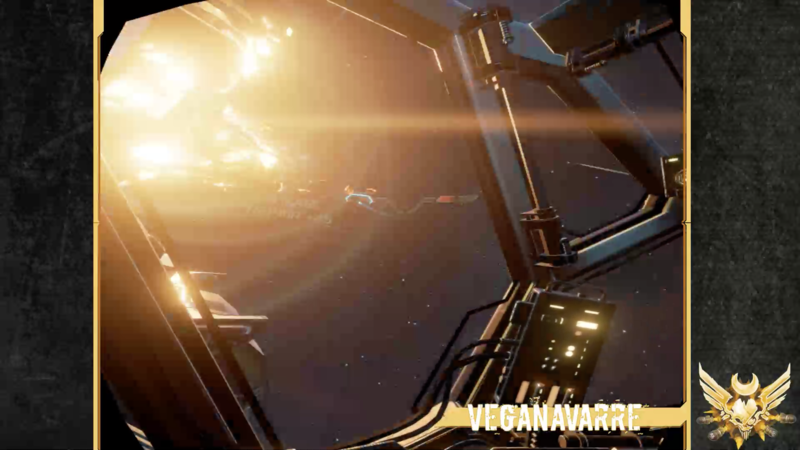 Ace pilot VegaNavarre has already got in on the act with his Revenant Reaping Quadkill video, where he plays with fellow pilots Anska and Simpology. The footage can be found on Twitch.TV right here. 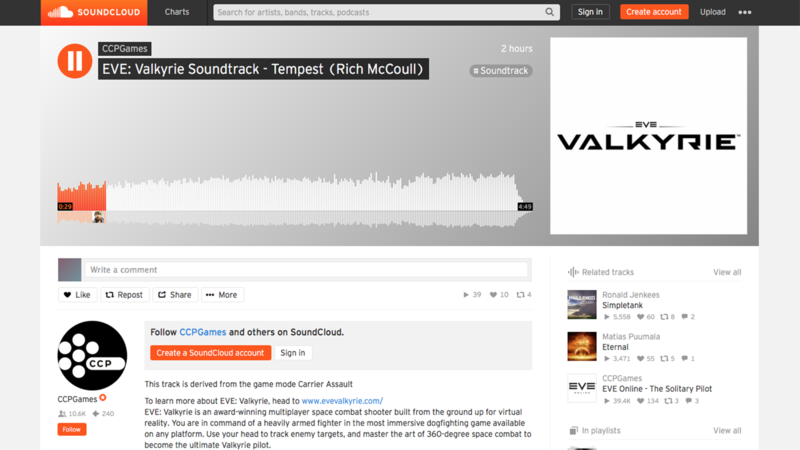 As part of the celebrations today, we have published part of EVE: Valkyrie’s soundtrack on Soundcloud for your listening pleasure. It’s titled Tempest and it's pretty darn cool, so put your headphones on and give your ears a treat. You can find the track here. That’s not all. We spoke to Rich McCoull, producer and engineer at the UK-based Post Production Studio The East Wing, to find out how someone gets into making music for games and what the process was with EVE: Valkyrie. First off, can you tell our readers a little about yourself. Like most people, I started playing in a band and studied music at college and uni. All the way through school and college, I was what I called 'clinically unemployable'. I'd go for jobs in bars with friends where they'd get something and I wouldn't. I tried shops when they needed extra staff at Christmas... nothing. So, when I applied for an assistant engineer’s job at a little recording studio where my band rehearsed, I didn't expect in any way to get the job. The competition for those things is insane, but that's how it started. I just seemed to keep getting jobs in sound when I applied for them. From then on, I produced bands, worked as a broadcast engineer and began writing more and more. I found a way into the world of advertising and writing music for TV commercials, which is when I set up The East Wing in 2012. My background as a composer started in advertising, film and television and has only moved into games in the last couple of years. I was asked to come down for a chat early 2016 by Andrew Willans, who I'd worked with previously. We share a lot of similar ideas musically and we'd talked a lot over the years about working together on something. The right project had just never come up. What are the specific challenges of writing a piece of music for a game? Challenges change project to project. I think the most important barrier to break early on is trying to develop a common language with the developers, so I can clearly understand what their requirements are. On Valkyrie, I came in really late in the day with a group of guys who had been working religiously with this game for, like, two years. As creative types, they had each developed really specific opinions about how the game should sound. The interesting part was that these ideas didn’t necessarily match everyone else’s ideas. Luckily, in this case, the team at CCP were all pretty open to a discussion and I really enjoyed that part of the process where we worked out exactly how this project was meant to be scored. One of the descriptions or buzz words that kept coming up was ‘dark’ and I asked everyone what they thought 'dark' meant in the context of music. I think there were about four different interpretations of what that could mean as a description of music or musical style. But, as with most situations, this is resolved when you start writing. Jon and Ash (EVE: Valkyrie sound team) provided some great stylistic ideas, so once I had some initial demos to listen to, then everyone involved had something to comment on. Clearly the main inspiration for the music comes from the game, but are there other sources of inspiration for your work? Movies, sci-fi, other composers? I love sci-fi films. Even some of the really bad ones. I frequently argue the merits of Alien 3 being a seriously underrated work… which might not be true, but the sound track is awesome. There are composers I love listening to, like James Newton Howard, Trent Reznor, Harry Greggson-Williams or Hans Zimmer, that have influenced the way I have developed as a composer. I love for a soundtrack to feel cinematic. There’s loads of bands I’ve grown up on that undoubtedly will have had an effect, like The Prodigy, Rage Against the Machine or Crystal Method. I even think what sort of music I’m into at the time I start a project will influence what I’m writing, even if not in a conscious way. So, the playlist I have on in the car on the way to the studio could impact what I write. What’s the process? You start with a blank sheet… take us through the steps. Sometimes it’s not really a step by step process, I’ll just get an idea from the brief, or playing the game, and it’s almost a race against time to get it out of my head before I forget it… which is problematic if I’m driving or on the bus. But, assuming there isn’t that spontaneous combustion moment, I’ll start by playing the game, or watching the visuals I’m working to. Then, I really try to establish what the narrative of the piece is. The music needs to tell the story, or support, say, an increased threat level. It needs to feel seamless. Next, passing round YouTube links with developers and others involved in the project helps it to become a more collaborative process. I think it’s important to try to get into other mind-sets in relation to the project. Without this stage I could completely miss a really interesting angle on the sound that hadn’t occurred to me. Then it’s about creating a palette of sounds, followed by looking for feedback to make sure it is in right ballpark. The beauty of Valkyrie has been the relationship with Jon and Ash at CCP. They have been amazingly concise with feedback and also introduced me to some soundtrack references I hadn’t come across before. Once that direction is signed off, then it’s about writing as much music as possible to fit the requirements. It's way easier to remove layers later if there are too many than to not have enough. Finally, sometimes there’ll be some specific tweaks once the music is in situ. A big thanks to Rich. That’s a fascinating insight into creating killer game music. Before we go, we just want to remind you that throughout the rest of the week we will be staying with the Carrier Assault theme. We will be bringing you a series of play guides, written by the best pilots in the galaxy and educating us on how to survive Carrier Assault in the three ship classes. We’ll kick off with the fighters tomorrow, then supports and heavies on the subsequent days.